Could anyone explain why the vegetation indices are not working in the desert region? I used Landsat 8 image which has been already radiometric/atmospheric corrected. I want to see the fractional vegetation cover in super arid environment in part of middle east country. Most of the area is covered by sand sheet, but there has a few trees and I wish I could extract them. So far, NDVI, SAVI, and EVI seems not working well. 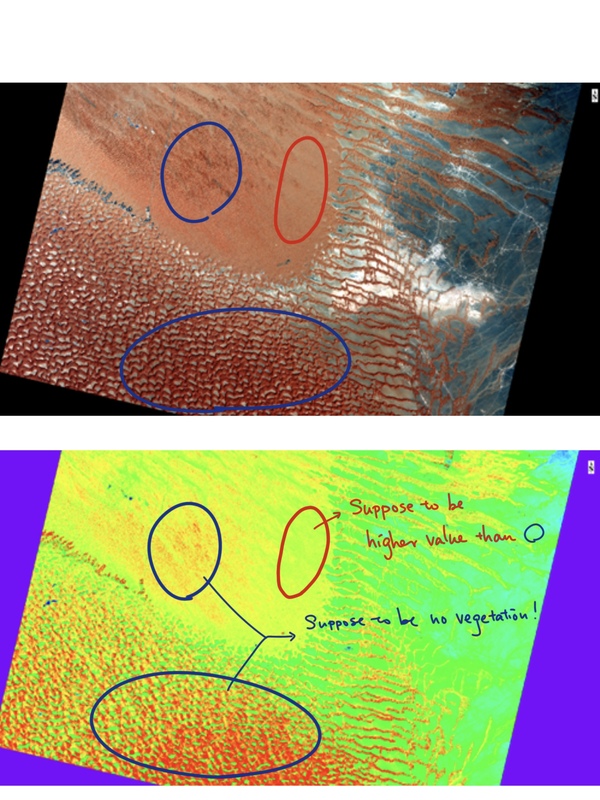 NDVI and SAVI output are quite similar, and somehow both have high value in some place which do not have any vegetation at all (blue circles in the image below). In contrast, the area contain a few trees has lower value (red circle). Only the value seems matching with real land cover types is agricultural area which shows in red colour. The SAVI image below is displayed as a rainbow scale, from low (-1): dark blue to high (+1): red. The sensitivity of the normalized difference vegetation index (NDVI) to the soil background and atmospheric effects has generated an increasing interest in the development of new indices. The NDVI index is saturated in high biomass and it is sensitive to a number of perturbing factors, such as atmospheric effects, cloud, soil effects, and anisotropic effects etc. The modified soil adjusted vegetation index (MSAVI) and its later revision, MSAVI2, are soil adjusted vegetation indices that seek to address some of the limitations of NDVI when applied to areas with a high degree of exposed soil surface because of the reflectance of light in the red and near-infrared (NIR) spectra can influence vegetation index values. The soil adjusted vegetation index (SAVI) was developed as a modification of the NDVI to correct for the influence of soil brightness when vegetative cover is low. The problem with the SAVI is that it required specifying the soil brightness correction factor L through trial and error based on the amount of vegetation. Not the answer you're looking for? Browse other questions tagged ndvi landsat-8 vegetation-index savi or ask your own question. Interpreting NDVI value on water? Determining vegetation health on temporal scale using mean NDVI?